Review | There is a lot about in the mid range. Volkswagen and Vauxhall order books are filling rapidly, closely followed by Peugeot and Renault. But do all brands offer a similar car with a different look or is there a real difference in this most popular range? Ford are trying to distinguish themselves with the new Focus. "What a nice car, I don't know this one", "the perfect shape of a raindrop" and "the last one was more beautiful". These are three random comments from outsiders to the new Ford Focus. The first is easily explained: the second generation Focus is only expected in the showroom in the New Year, which doesn't yet make the car well known to everyone. Thanks to the sloping joint of the rear window the Focus has the perfect shape of a raindrop. Whether the new Focus is less beautiful than the last one is a matter of taste. The lines however are clearly less innovative and radical than before. Fact is that the 3-door version is a lot more attractive and looks more sporty than the 5-door. Whoever struggled with the lines of the interior of the previous Focus will feel more at home this time. Calm and subtleness set the tone here as well. The most important eye catcher is the (optional) radio CD-stacker by Sony. The sound is heard to better advantage here than in de Focus C-MAX and compared to the old Focus the progress is huge. For the future Focus, Ford also announces a number of special options. Voice recognition would reduce the number of buttons dramatically. Thanks to Bluetooth-technology a showy car kit will be a thing of the past. The headlights turn with the steering, which helps the driver look around the bend in the dark. Keys will become superfluous because of the "Key Free"-system. Finally there will be a complete entertainment system on offer comprising of a DVD-player and two screens in the back rests. Since the test vehicle was driven some time before the introduction to the consumers these options are not available at the time of this article. Despite that it is clear that Ford has taken the Focus to a higher level where technology and equipment are concerned. It may be a coincidence but the Focus is the third test vehicle in line that is so spacious that the (well built) test driver can not reach the pedals with the seat in the furthest position. So there is plenty of room and because of the excellent adjustments that can be made to the steering wheel and the seat, drivers of any shape or size will find the perfect riding position. The seats in the driven "Ghia Titanium"-version are upholstered in leather. Just the quality of the seats makes every hour in the Focus a pleasure. The only disadvantage is that the (also optional) seat heating is so slow that even the most cold-blooded driver will have warmed up the seat by himself long before the effect of the device becomes noticeable. The finish is of a higher standard than before too. The enormous doors slam with a solid thud. The interior has an exquisite finish and everything feels extremely durable. The increase in the space in the front of the car also repays in more storage. The glove compartment is deep, the door pockets huge and even on top of the dashboard you will find a useful storage compartment. The back seat is reasonably accessible and here too the Focus appears to be more spacious than average. The passenger slides deep into the leather seat and automatically assumes a relaxed position, which means the low roofline does not create a problem. The backrests of the front seats have quite a big hollow, which provides extra legroom in the back. Obviously the room in the back will never compare to a limousine or a spacious MPV, but for a compact 3-door with coupé aspirations there is a surprisingly large amount of room. Space and ergonomics are fine, but in the end what it comes down to is handling and performance. Ford always distinguished themselves with that especially in the Focus: To put it bluntly: it almost seemed impossible, but the new Focus does drive even better than its predecessor. Handling on bad road surface, "gliding" on the motorway and fast cornering have all been taken to a higher level. Not only does the Focus keep its prime position for the best qualities in driving in this range because of this, but it has increased the distance from the competition. Each ride in the Focus is a pleasure. Besides pleasure, good handling on the road means a high level of security too. Airbags and crushable zone are a last resort, but a car like the Focus can swerve safely even at high speeds so any other emergency provisions are unnecessary. That has been the most important motive for choosing the Focus and it still is. 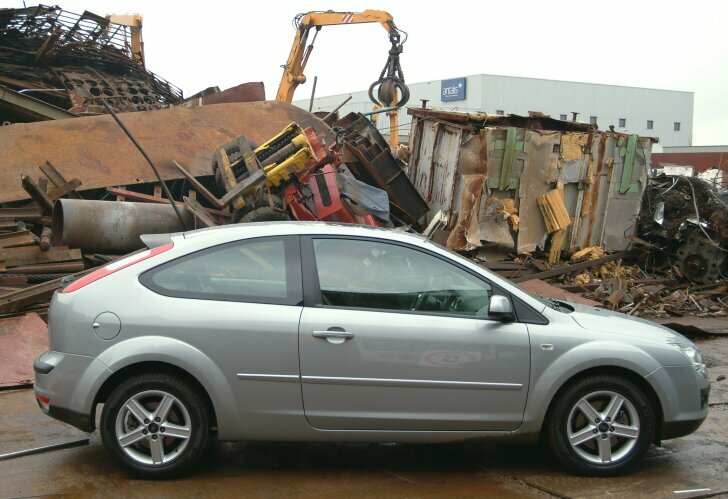 From the introduction the Focus will be available in a 1.6 and 2 litre diesel engine. The sizes of the petrol engine will be 1.4, 1.6 and 2-litre. The test vehicle is equipped with the latter and that crowns it all. Thanks to the considerable capacity of almost 150 h-p the 2-litre Focus performs splendidly. As long as the engine is revved up, the Focus 2.0 is quick and lively. Changing gears is light and precise. The brakes are powerful enough to have everyone pressed up against the windscreen in the case of an emergency stop. Still, this smooth version doesn't encourage speeding. The 2-litre engine intends to achieve its performance with great ease. This 4-cylinder Duratec Ti-VCT (Twin Independent Variable Camshaft Timing mostly offers plenty of flexibility and provides the driver with a feeling of driving a superior car. Ford promises that this technology realises a reduction in fuel consumption of 5%, but despite this the consumption is considerable. The manufacturers data of 40 mpg is difficult to achieve. A "sporty" driver has to consider an average consumption of about 28 mpg. Ford has done it again. 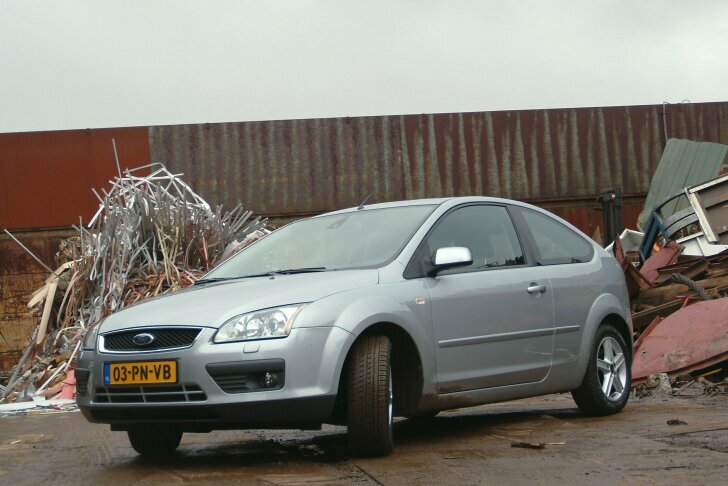 The first Focus had the best handling of all compact mid range cars and the new generation only consolidates this position in the market. This not only expresses itself in driving enjoyment, but also in active safety. The lines of the new Focus are conservative, but then on the other hand the newcomer is very spacious in the front as well as the back. What is more the 3-door is a feast for the eyes that can almost appear to be a coupé. The 2-litre petrol engine performs well and with great ease, which gives the car a superior feel. Searching for disadvantages is looking for a needle in the proverbial scrap yard. This results in a slow working seat heating, a rain sensor that isn't up to its job and a higher than average fuel consumption. Scrap or focus in the middle section of the mid range? 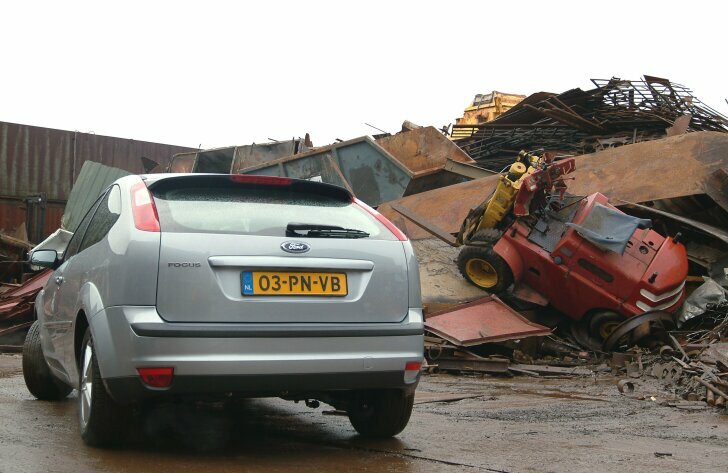 Forget the scrap, the new Ford Focus comes out on top!